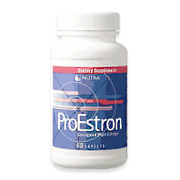 Pro-Estron is a blend of natural Phyto-Nutrients including Dioscorea (Wild yam), Black Cohosh, Dong Quai and liquorice root which act to help prevent dietary deficiency of important nutrients that take part in maintaining the health and well being of women during menopause. The ingredients in ProEstron are standardized in order to guarantee that each dose is uniform and consistent. Many women can see improvements in their menopausal symptoms in as few as 3-4 weeks and some will see benefits after 4-12 weeks. ProEstron’s formula is designed to build slowly and naturally in your system, so we recommended taking it for a full 90 days to experience the maximum symptom reduction. ProEstron is designed to deliver standardized phytoestrogen activity from a variety of botanical sources, including glycrehetic acid from licorice root and 27-deoxyactein from cimicifuga racemosa. An independent study with 381 symptomatic menopausal women using ProEstron showed that 92% of the subjects were relieved of hot flashes while close to 90% experienced improvement in sleep disturbances, anxiety, night sweats, heart palpitations, and other symptoms associated with menopause. Take 2 caplets daily. or as directed by your health care practitioner. Together, "phyto" (plant) and "estrogen" (a dominant hormone in females), refer to a class of plant-derived compounds that have an estrogen-like effect in the body. Phytoestrogens are much weaker than estrogen, hence they are not associated with the side effects of other estrogen therapies. There is a significant body of scientific evidence to show that phytoestrogens may provide protective benefits against more potent estrogens while assisting in the management of menopausal symptoms and inhibiting the oxidation of LDL cholesterol. ProEstron is shipped in a discrete, unmarked package. Orders are processed immediately and usually take about 3 to 5 working days to be received. We do ask that you try it for 2 to 3 weeks to feel the full effects. Any information received is used only for order processing and shipping purposes. Your information, such as e-mail address, will never be disclosed to a third party.